‘Sign of the Apocalypse’ inspires book. ARUNDEL – John Getchell is never sure who is going to turn up at his Arundel doorstep, or what is going to show up in his yard. 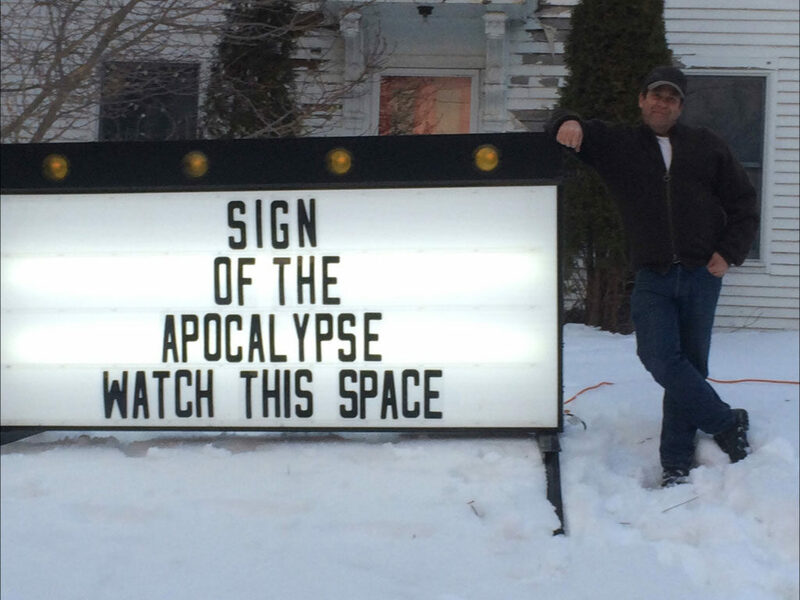 In the almost three years since he first set up his “Sign of the Apocalypse,” an internally illuminated portable marquee on which he curates daily musings, he has had people yell from passing cars, ring his doorbell, and even leave garden sculptures on display. “One day there was a garden gnome. Another day there was a metal sculpture of a duck. Another day there was a statue of a sasquatch,” Getchell says. Other visitors leave books of quotes for inspiration or share their thoughts on what Getchell should do next if they catch him in person. One such visitor? Cynthia Hall Domine, president of Kennebunk-based Synchronicity Licensing. “I drove by the sign a few times, and I said to my husband, what’s the deal with the guy on River Road with the sign?” Domine says. Now thanks to their partnership, Getchell has a new book featuring photos of his favorite sign sayings, and is spending the holiday season touring the area in promotion. Getchell never had dreams of monetizing his roadside ruminations. The sign started as a way to fend off boredom during the particularly snowy winter of 2014-2015. Getchell, who works as a contractor renovating old houses, says, “I was really low on work, and getting a little bit of cabin fever.” One day while wandering the aisles of Sam’s Club, he stumbled across the type of illuminated sign normally seen outside of car dealerships, or churches. “My first thought was I just wanted to find the letters and write something a little inappropriate and sit back and watch the fireworks,” Getchell says. Unfortunately, the letters were nowhere to be found. Then it occurred to me,” Getchell says. “I could have this! I could put it in my front yard and I could change the message every day! It could be my analog twitter! And I could be sort of like a modern-day Ben Franklin with his Poor Richard’s Almanack. Getchell called his girlfriend to share the idea, but she wasn’t sold. He got the sign home, called a friend, and immediately set it up in the snow. Several cars pulled over to see what was happening, including one asking if Getchell was starting a church. He answered, yes. Then, he started writing. “I filled a yellow pad almost instantaneously. All the initial ideas came really quick. For some reason, short quips come easily to me so I just had a pile of them to begin with.” Getchell says. While the initial feedback from passersby was immediate and positive, Getchell’s girlfriend remained unamused. “She did indeed break up with me,” Getchell says. Almost three years later, among several ongoing series, Getchell features tongue in cheek pleas to his ex, protected with the alias Wendy, asking her to take him back. Other regular themes include interesting contemporary phrases translated into Latin and very, very short stories. 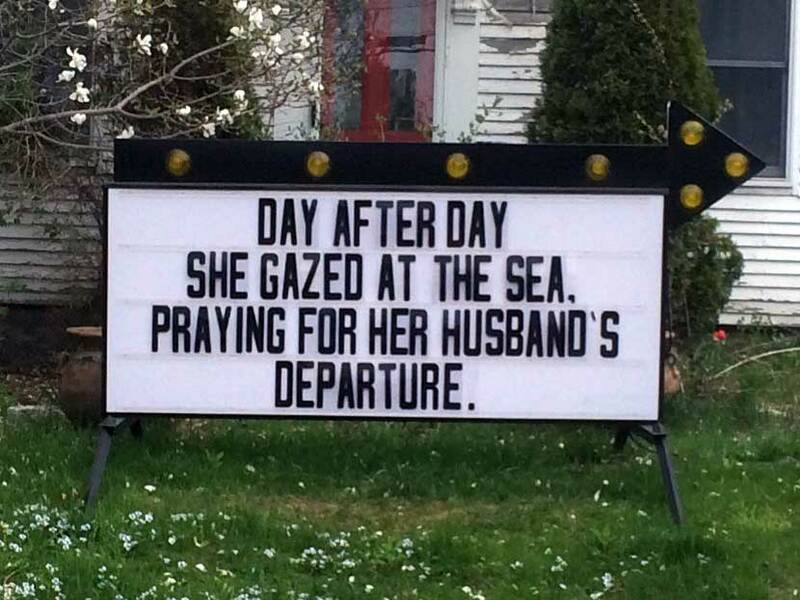 “Day after day she gazed at the sea, praying for her husband’s departure. That’s a very short story, but there’s a lot of information in there,” Getchell says. Originally Getchell planned to keep the sign going for as long as he could, potentially up to a full year. At the time, he expected he would be shut down, or at least face challenges. So, is the sign in compliance with Arundel town statutes? Getchell chooses to focus on the positive. Now, with the help of Domine and the new “Sign of the Apocalypse” book, Getchell’s wit is reaching a crowd beyond those who commute by his house. So what’s next? By Bridget M. Burns / York County Coast Star Contributor. See the original article at Seacoast Online.